The Polishin’ Pal Clay Disc enables you to clay without getting clay residue or lubricant on your hands. One side of the disc has hook & loop material to attach to the Polishin’ Pal. The other side of the disc is smooth and slightly sticky in order to hold the clay. The discs are reusable and clean up with just a little spritz of clay lubricant. Wolfgang Elastic Poly Clay Bar removes hidden contaminants that washing leaves behind. 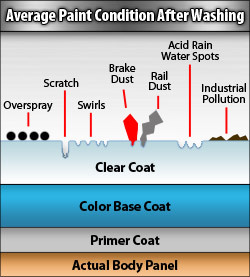 Detailing clay deep cleans auto paint by removing microscopic, embedded debris that gradually harms the paint. Wolfgang Elastic Poly Clay Bar is a long-lasting, reusable, synthetic detailing clay bar that will leave your vehicle smooth, shiny, and unbelievably clean. This 100 gram clay bar can be used between 7-10 times on average. Your Polishin’ Pal isn’t just for claying! Use it with a white pad to apply pre-wax cleaners and glazes, or to give your wax a touch of cleaning power. The white pads are dense enough to gently polish the paint without abrading the clear coat. The pads secure to the Polishin’ Pal with hook & loop facing. Great for paste waxes! 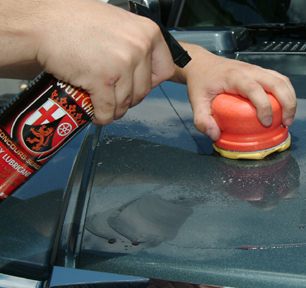 With the Wolfgang™ Polishin’ Pal Clay Kit, your paint will go from bumpy to brilliant! 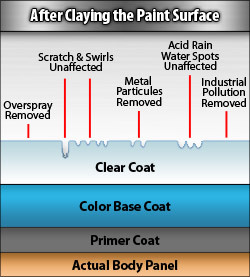 Give it a try and see how easy it is to clay your way to perfect paint. Cut the 4 oz. bar in half and store one half in an airtight container or bag. This works awesome. I have used it on a couple of different cars. Perfect clay for your car. Excellent item and package. !very helpful and saves you time! I have not used the product yet, but I received the shipment in two days. Followed AutoGeek's application instructions and the results exceeded expectations. Clayed a 2004 Ford Mustang, the clay removed all surface contaminents and was smooth as glass afterwards. Don't even consider a harsh rubbing compound, when this product will out perform the compound with less effort and no clear coat damage.